Though some predict a move toward an increasingly cashless society, this does not necessarily mean that credit cards are absolute must-haves for consumers. Some people choose to live without credit cards, yet still have other forms of debt such as car loans or mortgages. Others choose a completely credit-free lifestyle, not borrowing any money for any purchases. No matter which option you choose, living without credit cards can be a difficult transition, particularly if you have relied on credit in the past and have grown accustomed to not having to save up to make purchases. One of the benefits to credit cards is that they can supply money and purchase power in the event of an emergency. Whether you need engine repairs or a medical procedure your insurance won't cover, credit cards can be convenient when it comes time to pay for something unexpected. Without the buffer of available credit, it's incredibly important to have some money set aside in an emergency fund. Most financial experts suggest an emergency fund with enough for three to six months of living expenses. You may find that it's easier than ever to get money set aside in an emergency fund when you don't have credit card bills to deal with every month, and may even soon find yourself with a fully funded emergency fund and no credit card debt - and that's a great position to be in. Make sure your funds are accessible. A debit card linked to your savings account should allow you to withdraw money from an ATM, although fees may be incurred. You may also want to choose a financial institution that is located throughout the country so you can walk in and withdraw funds wherever you travel, even if you decide against a debit card or need to make a cash purchase. At the very least, take a checkbook with you while you travel in case you encounter a financial emergency. You can still enjoy the convenience of swiping a card at checkout without using a credit card. A debit card is linked to your checking account, so the cost of purchases are debited directly from your checking account instead of incurring debt. Debit cards are great for those times when you don't want to use cash (or can't use cash, as is the case in some instances where merchants won't accept cash). They also allow you the option to make purchases online or to set up monthly recurring payments. Prepaid cards are another option, although these cards are generally fraught with high fees and may wind up costing you more than it would have to use a credit card. Some companies balk at accepting debit cards or cash for purchases. In particular, car rental companies and hotels are both well-known for making it difficult for credit card-free customers. While these companies will accept debit cards, prepare to provide a hefty deposit or have a large hold put on funds in your checking account. If you need to rent a car or stay in a hotel, contact the company beforehand to find out their policy for accepting cash or debit cards for payment. The company may want additional documentation, including proof of residency. Ask the required deposit amount or hold that will be placed on funds in your account, as well as how long it will take before you get that money back or the funds will be released. Purchasing habits have to change when you stop using credit cards. If there is a big-ticket item you want to purchase, you'll have to save for it or pull the money from your savings account instead of simply using a credit card. You may have to modify the way you think about spending if you want to be successful without credit cards. Only buy what you need, set money aside for big purchases and try not to let impulsivity invade your wallet. The end result is that you'll think more critically about your purchases and likely end up saving money in the process. Studies have shown that consumers using credit cards generally spend more than those paying with cash, checks or debit cards. A comprehensive budget will help you keep your spending under control while also allowing you to manage your money. Online purchases are nearly impossible if you're on a cash-only basis, and even if you have a debit card there may be some instances when you don't feel comfortable sharing your debit card information with an online vendor. Luckily there are multiple options for paying for purchases online without using a credit card or revealing checking account information. Consider services like PayPal or Google Wallet, both of which allow you to make payments directly to online vendors without providing your debit card or checking account number. Not all online merchants accept these services, but their acceptance is increasing. Purchases can also be made in-person using PayPal to participating merchants like Starbucks and Home Depot. BillMeLater is a PayPal service that allows you to open a revolving line of credit and make purchases that you pay back in installments. Special offers frequently allow customers to pay over time without any interest fees, although there are restrictions to these deals. This is a good alternative for people who want to be able to make purchases and pay over time, yet who do not necessarily want a plastic credit card. The list of merchants accepting BillMeLater is increasing; airlines, furniture stores and even tax preparation services are among the ranks of retailers accepting this form of payment. While it is true that responsible credit card usage can help raise your credit score, credit card usage is not the single biggest factor in determining your score. If you have other loans - student loans, car loans, mortgages, or personal loans - your credit score can thrive without credit card usage. On the other hand, if you give up credit altogether, your credit score will likely drop significantly. You have to decide if this is a significant enough factor to deter you from using credit at all. Remember that your credit score can affect other aspects of your life beyond borrowing, including insurance rates, the ability to rent a place to live and even some employment opportunities. Provide copies of recurring bills to show your ability to make payments on time, such as your rent statements or utility bills. Provide a copy of your bank statement, showing you have ample savings. If applying for a mortgage, request manual underwriting - this is where a person looks at your application instead of the application being run through an automated system. This allows you to explain your lack of credit. A cosigner can be a last resort in an attempt to get approved for a loan. 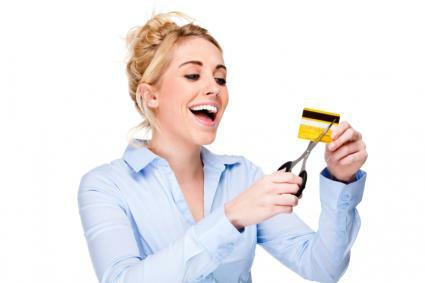 Living without credit cards can certainly be challenging at first. Once you become accustomed to more thoughtful purchasing behavior, however, you will probably find that your personal finances thrive.